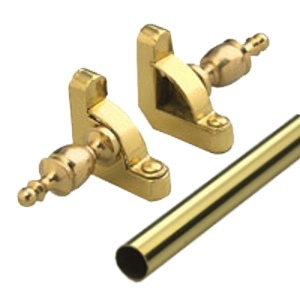 The most versatile of any stair rod collection, Zoroufy Heritage Collection offers an all brass construction, with lacquered finish for long life. Bracket cover hides mounting screws but easily swings open for periodic cleaning of rod & stair. Accommodates up to 27 in. wide runner. Rods can be easily cut with tube cutter or hacksaw for narrower sized runners. The most versatile tapestry & rug wall hanger with grand pineapple finials. Zoroufy legacy collection offers an all brass construction, with lacquered finish for long life. Rod is easily adjusted to accommodate 28" to 48"wide rugs & tapestries.